Recently renovated, Haceta Head light near Florence, Oregon is postcard pretty. 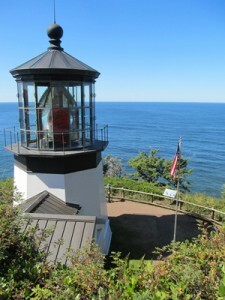 At 38 feet high, Cape Meares is Oregon’s shortest lighthouse. Cape Meares Lighthouse: Although it stands 217 feet above sea level, the structure itself is only 38 feet high, making Cape Meares Oregon’s shortest lighthouse. Built in 1890 and still operational, it’s located about 10 miles west of Tillamook off Highway 101 on the north end of Three Capes Scenic Loop Drive. 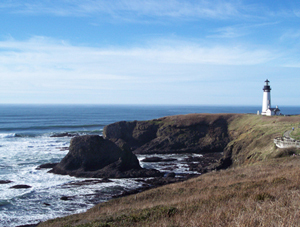 Yaquina Head is the most visited lighthouse in Oregon. Bridge in Newport, dates to 1871 and was actually the first light used in this area. It was replaced by Yaquina Head and now serves as a museum. 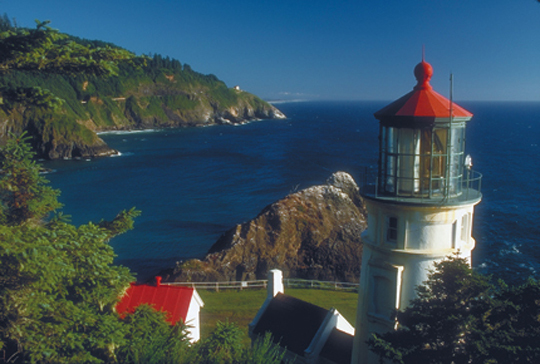 Heceta Head Lighthouse (Pronounced Ha – SEE – Ta): Built in 1894 about 12 miles north of Florence, postcard pretty Haceta Head light is the most powerful light along the coast, signaling ships up to 21 miles out to sea. The Queen Anne style lightkeeper’s residence is now a bed and breakfast (some say it’s haunted!). Listed on the National Register of Historic Places, this light is about 205 feet above sea level and stands 65 feet high. It has recently undergone restoration work so it looks better than ever. Cape Blanco Lighthouse is the oldest continuously operating light (built 1870) in Oregon. Cape Blanco Lighthouse: Nine miles north of Port Orford and six miles west off Highway 101, this isolated lighthouse holds at least four Oregon records: it is the oldest continuously operating light (built 1870), the most westerly, shines 256 feet above sea level (the structure is 59 feet high), and Oregon’s first woman keeper, Mabel Bretherton signed on in March 1903. 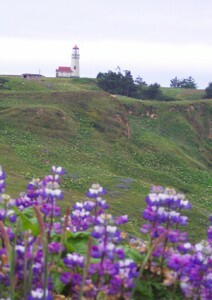 Cape Blanco is still operational today. It was August 7, 1789, when the United States Congress approved an act for the “establishment and support of Lighthouse, Beacons, Buoys, and Public Piers.” In Celebration of the 200th Anniversary of the signing of the Act and the commissioning of the first Federal lighthouse, Congress passed a resolution which designated August 7 as National Lighthouse Day. Oregon lighthouses, like those found along the coastline of other parts of the USA, are literal highlights of each state’s maritime heritage and well worth a visit. August 7 is a day to honor these beacons of light that symbolize safety and security for ships and boats at sea.